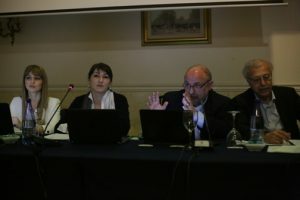 As part of the planned activities for dissemination of the results of the Erasmus+ project – MATH-Labyrinth, there was a panel session held on 22 April 2017 in Thessaloniki, Greece. 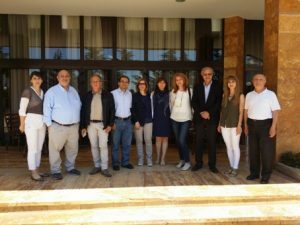 The event took place during the MASSEE board meeting where representatives of math associations and societies form Serbia, Bulgaria, Romania, Greece, Cyprus, Macedonia etc. were present. The purpose of the event was to disseminate the main outputs of the project- the MATH-Labyrinth interactive book and the Guidelines for teachers in front of members of math associations and societies from Southern and South-Eastern Europe. One of the main outputs, the interactive book with real life problems, was presented during the panel session. 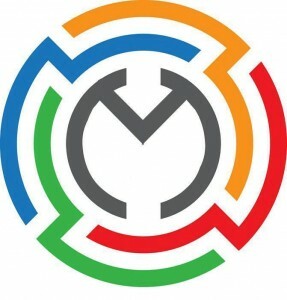 By solving these kinds of problems on the project platform http://www.math-labyrinth.eu/math-labyrinth-interactive-book/, the students will be able to acquire long term knowledge, and be motivated to study mathematics, as well as encouraged for long life learning. The students that acquire skills using this method of solving real life problems will be creative, think critically, analytically, and they would be able to cope with the reality. The positive feedback and comments by the audience are an indicator that this intellectual output is successful, and it shows the fact that it could be used by math teachers in primary and secondary schools. As part of the activities for dissemination and affirmation of the MATH-Labyrinth project SOU Gimnazija Koco Racin participated at the international conference Mathematical Days In Sofia 2017 organized by the Institute for Mathematics and Informatics at the Bulgarian Academy of Sciences. The conference took place in the period between 10 to 14th July in Sofia, with about 260 participants. 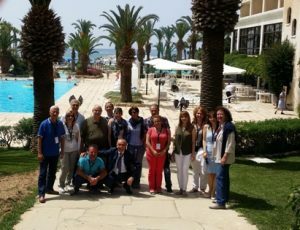 The conference had invited plenary speakers; there were section talks, mini-symposia and research contributions organized in the facilities of the Academy. 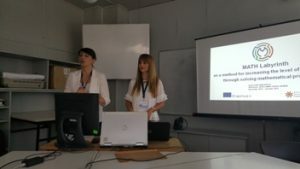 The project, its objectives and results were introduced to the audience through a presentation of the abstract “Solving Real-life Problems for Increasing the Motivation of Students in Learning Mathematics“ on 10 July 2017 at the Institute by Marice Lazarovska and Hristina Leova. One of the priorities of the European education, and in our country in general, is increasing the knowledge of students in mathematics. The students use computers, mobile phones and other electronic devices to satisfy their daily needs. If we manage to encourage them to use the technology for research and solving problems in real life situations, then we will motivate them to learn mathematics and increase their level of knowledge. This is the reason why we have developed the Math-Labyrinth interactive book. The problems uploaded on the platform are in accordance with the secondary education curriculum in mathematics and they all relate to everyday situations. If a student comes across a difficulty in solving problems, he/she can register on the interactive book and ask for help. The book contains a large number of problems that enable visualization and step-by-step approach in solving. The audience comprised of teachers, university professors and mathematicians followed the presentation carefully, asked questions, gave positive feedback and expressed their hope for further cooperation. 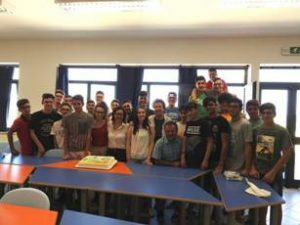 MATH-Labyrinth is a two year Erasmus+ project in the key action Strategic Partnership for innovation and exchange of good practices whose coordinator is SOU Gimnazija Koco Racin from Veles. 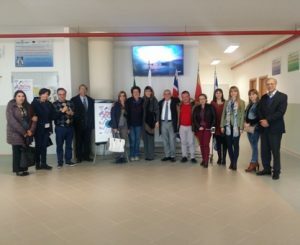 The strategic partnership involves two secondary schools from Bulgaria and Italy, two mathematical associations from Cyprus and Greece and Goce Delchev University from Stip. The camp in Macedonia was held in the mountain resort Mihajlovo where they registered and used the MATH-Labyrinth interactive book. The students took an entry and a final test so that the teachers could assess their skills and competences in solving real-life problems. During the use of the book, the teachers filled in evaluation forms and questionnaires in order to monitor the students’ motivation, approach to solving problems, the need for using additional help and open educational resources. The students were motivated to do mathematical problems applicable in real life. The students were happy and interested in the activities during the camps. They got to know the natural beauties of Kozuf mountain by mountain hiking and sport activities. As a result of successful completion of the activities, the students and teachers were awarded certificates. SOU Gimnazija Koco Racin, as a coordinator of the project MATH-Labyrinth with the grant awarded by the National Agency for European Educational Programmes and Mobility, organized a short-term joint training event for all the partners included in the project. 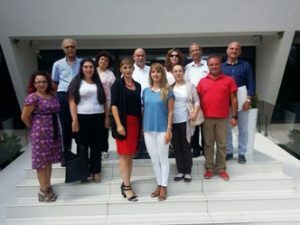 The training event took place in the period between 29 May until 4 June in Hotel “Sileks”in Ohrid, with two representatives from each partner organization. During the event there were workshops, interactive presentations and open discussions related to the use of the MATH-Labyrinth method by the participants in the project. In this manner, the attendees acquired the skills and competences to implement the method in their future practice, as well as sharing it with the interested parties. Besides the working sessions, there were some cultural and social events organized for the participants. 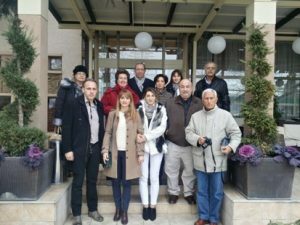 Some of them included sightseeing of Saint Naum, a guided tour around the old city of Ohrid, etc. 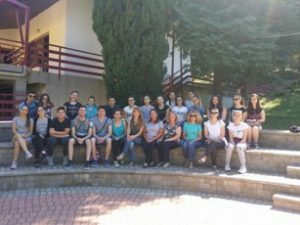 The purpose of these activities was the partners to get acquainted with the culture and the tradition, and to see the monuments in Ohrid. 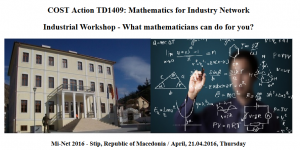 Industrial Workshop – What mathematicians can do for you?